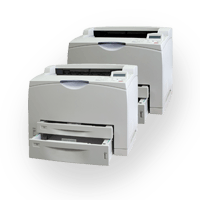 OM Plus can be configured to provide automated print failover at the printer level. When the primary printer fails, jams, runs out of paper, or has other issues OM Plus can be configured to route the print job to a backup device. Print failover may start on the backup device at the beginning of a job or on the next expected page. When printer failover is invoked OM Plus also has a notification feature to inform the user or help desk of the situation including the health status (via snmp) of the failed device. In addition, OM Plus on the host or application server can be used to provide automated fail-over at the print server level. OM Plus can be configured to direct jobs to a primary OM Plus print server. Should that server become unable process jobs, they can be automatically re-routed to a backup Om Plus print server. Utilizing OM Plus is a cost effective way to improve print fidelity and to reduce the cost with printer failure. We have high volume distribution centers where we cannot afford to have print failures. OM Plus provides us a reliable fail-over solution so that when our primary printer goes down we keep on printing with the next backup printer. It has helped us immensely.